The Eights Final between Plum Pudding and Abingdon Utd B took place on Thursday 20th Sept. The venue was moved on Finals night as Ab.Utd were due a training match and with high winds/rain forecast it would have been too exposed by the football pitch having to play on the non-home pitch for Utd. The venue was the Spread Eagle and although a few sticks went sideways in the wind the rain mostly held off and the game was played. 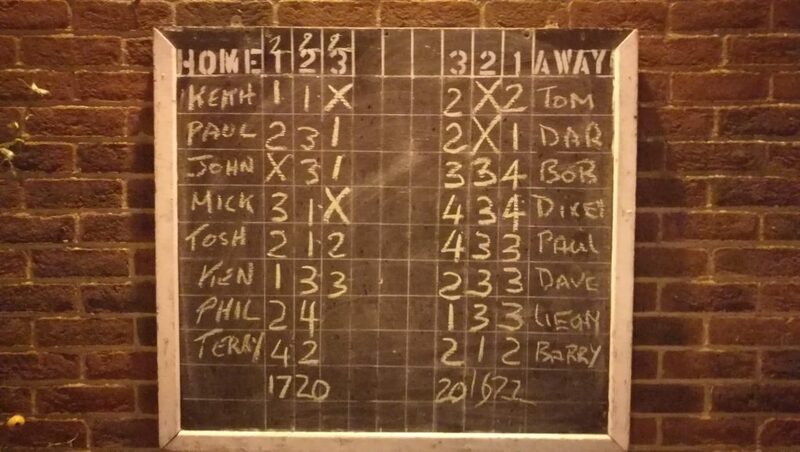 Plum took Ab.Utd (league winners) to 3 legs but couldn’t match Utd’s 20 dolls despite the 2 handicap. Presentation Night for all trophies/plaques for Section and Competition Winners will be on Friday 30th November at Ab.Utd FC. Programmes will be on sale soon at the winter league on Wednesday evenings at Ab.Utd.